Good quality programming makes a radio station trustworthy. Kyrgyz community radio station Radiomost takes this common wisdom not only as a lip service. When Radiomost will go on air, these motivated journalists are ready to inform and entertain Talas citizens. The official start of the Unesco funded community radio station on 100.5 FM is scheduled for end of August. The mission of the radio station is to fill the information gap in this region. Talas is a secluded region in the Tien Shan mountain ranges and this also means that news or other information rarely reach the locals in time. After the break-down of the Soviet Union the communication infrastructure went down, as well. Today, many villages in this rural district do not have telephones and local radio stations and newspapers have been given up. Naturally Radiomost faces a big challenge and there is still a lot to learn – but with each new workshop the vision of a viable community radio becomes more and more reality. And some of the trainees have already developed ideas for their own programs. “I want to do my own radio show and will focus on family problems. For instance, bride kidnapping is a big problem here and I want to bring this issue to public attention”, says fifth-grade student Salkinai. 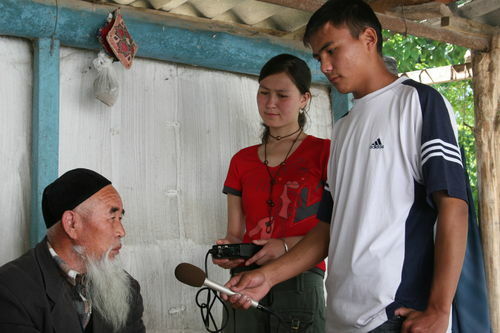 In order to better understand the information needs of Talas citizens, the journalism training program also includes audience research and radio programs will be developed according to the specific information needs of Talas people – each day will be dedicated to a certain sphere, so there will be news, for instance, for farmers, women or young people.